No need to waste a lot of time recapping a slow and boring overnight trade. I compare the ag markets today like that scene from Wizard of Oz where a black and white Dorthy opens the door to a fully colored Oz. The markets have been trading in the dark so to speak concerning 2017 US fundamentals, but after today we will get a nice shot of color as we will see not only what we have on hand (March 1 stocks) but we can start to formulate what the S/D tables will look like at the end of the growing season (assuming we grow it). Cotton markets are probably the most poised to move given the heavy long position in the funds. I do think there has been a good deal of hedging going on the last few days, so be very careful chasing this thing lower. I think there is probably pretty good support in the low 70’s/high 60’s for December. Demand is solid and exports have been killing it in recent weeks. I do not expect that to change. As I mentioned yesterday and on the phone if you are a client, making a hedging decision here is easy. Figuring out what to do when it breaks will require more black belt thinking. Regardless, its expected that an on expected acreage report with trend yields will show ending stocks near 6.5 million bales, 2 million over the ’16 ending stocks. In corn and beans, traders have a distinct memory of last years bearish surprise and the resulting price action. Many are calling to have folks buy breaks, which I agree with but if you followed me yesterday with puts in June SD, you can at least sleep at night while you try. Given how the SAM crop looks and the slowing of US exports, a 92+ number in corn might see lower prices hold for a while. 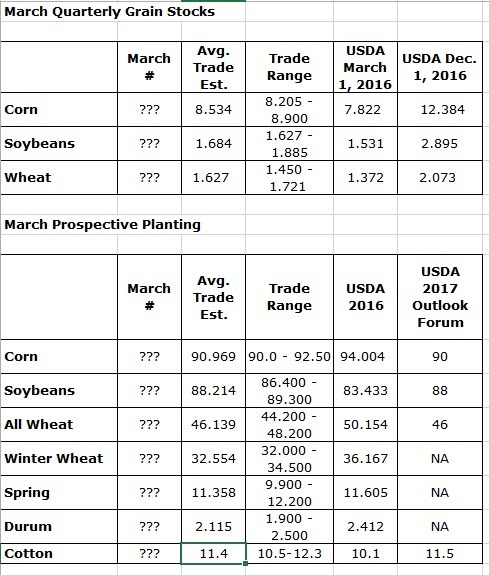 The trade would say if corn is at 92+ then beans are near 85 or 86, but I dont know if that is going to be the case. I think we could see acreage near 87.5 in beans and 91+ in corn disappointing everyone. From the small sample surveys I do, folks were not shy about planting corn. It was wheat they were running from. Wheat Eventually US weather will dictate but the acreage is probably secondary to the stocks number that is almost a billion higher right now. The COT report from tonight will show another week of expanding fund shorts in grains, while funds’ net long position in beans is expected at the weakest level since early March of 2016 (well above that level right now though). The bulls will point to these numbers as reasons to buy. I agree with them to a certain extent but in the case of soybeans there is plenty of room to fall if the bears want to take it back to where it was in Q1 2016. Corn and wheat are much more supported in that facet. I am not bearish here, but I think the markets could knee jerk lower causing some panic selling by the few longs left, which could provide some awesome value opportunities in corn going into the growing season. My rec for today would be to buy the JUNE SD 365 put for a nickel and then put in an open order to buy Dec 17 futures on a break to 360-370 depending on your patience. I will remain long KC wheat headed into this thing with the idea of holding a break. I think acreage supports the wheat market and stocks could show a little surprise given the high pace of exports and the feed rate. Oh yea and the fact that no one is planting wheat.